A hardwood baserail with Victorian profile machined from solid prime grade European Oak. A hardwood baserail with Victorian profile machined from solid prime grade European Oak. 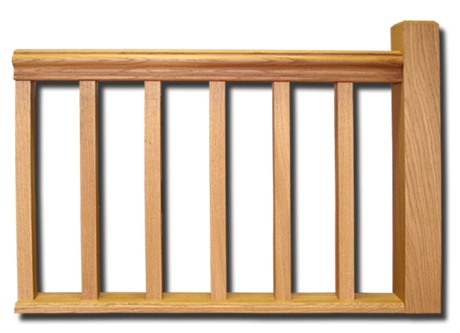 European Oak has a light honey tone which displays natural grain and figuring and some small knots. The timber is supplied unfinished (planed smooth but bare) ready to take a finish of your choice. The overall size is 70 x 20mm with a 32mm rebate in the base to house our 32mm spindles. The baserail is supplied with a 32mm fillet piece. Our timber is sourced from FSC certified saw mills in France, and is kiln-dried to an average moisture content of 8-10%. The timber is stored, before and after machining, in our heated and humidity controlled factory. All our timber products are manufactured by our skilled craftsmen using state-of-the-art British and German wood-machining technology, ensuring timber products which are precision perfect and a pleasure to fit. If you require lengths longer than 3m, or matching treads, risers and stair strings, please contact our Sales Office who will be happy to discuss your requirements. We can also machine matching newel posts, handrails and spindles, however, the manufacture of assembled stair cases is not something we are able to offer at present.